The unique natural environment and geology on the Dolomite Alps were the decisive factors for the worldwide highest award for a natural site: The title “World Heritage! It’s official; the South Tyrolean Dolomite Alps around your 4-star-superior Leitlhof Hotel are one of the world’s most beautiful mountain landscapes! It took one decade before the South Tyrolean Dolomites were announced UNESCO World Heritage. For the holiday region this title started a new era. The Dolomite World Heritage stretches over 142,000 hectare with the provinces Trento, Belluno, Bolzano, Pordenone and Udine. Including the buffer zones South Tyrol has a land coverage of 231,000 hectare with awarded World Heritage sites. Natural World Heritage Site status ensures long-term preservation and protection of the habitat of the indigenous animal and plant species of the Alps, and which make this province that has developed in such wonderful mountain formations so impressive. Among these are, for example, the rock partridge and the western capercaillie, the deer, the badger and many woodpecker species, while plants include rare alpine orchids, achillea, columbines, and of course the alpine star. Your Leitlhof Hotel is located in the middle of the Sextner Dolomites World Heritage and the nature parks Fanes-Sennes-Prags and Drei Zinnen. This means that as guest you will find yourself at the perfect starting point for wonderful excursions to the most beautiful places in South Tyrol, and for many other summer or winter activities. The precious award by UNESCO gives these mountain landscapes the chance to survive in the future. To be part or the World Heritage also means to protect and preserve the natural environment. Areas that were polluted before have to be released from the pressure. 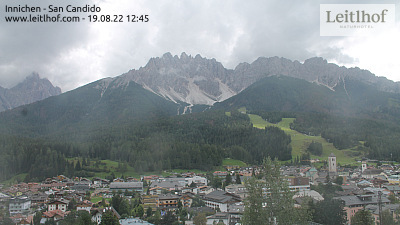 It is also necessary that the regional tourism and politics rethink in order to keep the South Tyrolean Dolomites healthy in order to be able to offer future guests an intact holiday oasis. The task for the South Tyrolean municipals is it to preserve and protect this natural treasure for future generations. All around Leitlhof it is clear how sport and the safeguard of the environment can go hand in hand, if limits are set and respected. For this, and for the safeguard for this province, we ask for the respect of the habitats of plants and animals, starting from the assumption that as guests you will comply with the current rules of natural parks. This is a way of together preserving and safeguarding this region also for future generations. As a hotel with zero impact on climate, Leitlhof has also extended the boundaries of sustainable holidays. Starting from the construction using sustainable materials, and the own hotel woodchip co-generation station, but also the regional products that we use in our kitchen. Thanks to the herbs from the vegetable garden of the hotel, the lamb from the Mühlhof family farm and the produce from many farmers of the area, our food could not be any better. This is a fact. Take a stroll through the stunning mountain landscapes, the lush meadows at high altitude or lovely smelling conifer forests during your holiday in Hochpustertal and send us your no obligation holiday enquiry.